For this project I took a similar approach to designing a corporate division of a parent company. I would build on the existing identity — tagging on a modifier for the Pittsburgh chapter that softly said Pittsburgh, in the already established, clean language, of the existing mark. There are a few differences between my contest submission and the final art I provided. 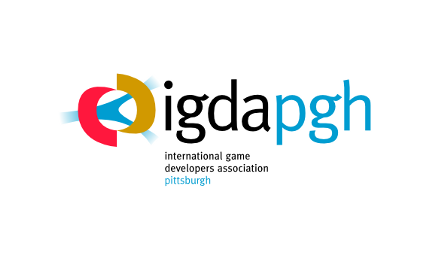 Namely the type used for pgh needed to match the face used for igda. Additionally the glyphs were further tweaked to match — either the face I used is not a complete match or the outlines in igda were slightly altered to give a unique look. Credit is due to the designer of the IGDA logo. If you know who this is please let me know.